The consequences of not having an equal distribution of wealth in the U.S., and what the Occupy Wall Street movement can do about it. | STOP Framing "us"
The consequences of not having an equal distribution of wealth in the U.S., and what the Occupy Wall Street movement can do about it. The level of income equality in this country has been in a reversing trend since Ronald Reagan’s presidency. However, many people will not know this by listening to Fox news, or some other radical right-wing talk show host, including Glenn Beck, who had this to say on his blog. This is Glenn Beck’s attempt to create further division among us by perpetuating the latest right-wing “frame”, which states that 47% of Americans pay no income taxes. This of course, is another Orwellian frame designed to convince all of us to take out our anger and frustration on the poorest and most disabled among us. After all, these are the people who make up the 47% Glenn Beck is referring to. Instead of looking up at the upper class who are truly responsible for our economic hardship, this frame ensures we look down at the very victims of income inequality, and ignore the fact that we are currently experiencing the largest transfer of wealth in the history of this country from the working poor and middle class (all of “us”) to a select few in the upper class (“them”). David Cay Johnston does a beautiful job of summing up what is really happening in this country, being led by those in the upper class, or the top .1%. Now, why do I say the top .1% instead of the top 1%? Well, this chart from the Economic Policy Institute says it all! Why is this important? Well, because the 26 year period prior to 1979 paints an entirely different picture. So, what does this mean to the average citizen? Why should anyone care about the income inequality that is illustrated in this article, or by what David Cay Johnston has to say? Here’s why – Prior to the current trend that has taken place ever since Ronald Reagan took office, a significant portion of our citizens (1 in 3) held a high paying union job. Everyone was doing well, including those at the very bottom. During this time period, those in the bottom 20%, in terms of income distribution, saw their incomes grow at a pace equal to those in the top 20%. As a result, 1 parent could work and earn enough to support the entire family. People could afford to purchase a home, save for their children’s college fund, and retire with the comfort of knowing they were secure in their old age due to the pensions they were receiving. Of equal importance, there was less poverty, crime, alcohol and drug abuse, imprisonment, obesity, teenage pregnancies, etc. Why? Because the more equal the distribution of income is in a society, the less social-ills seen in that society. (See the about section of this blog). Notice there is no Occupy Sweden movement taking place. As a result of the increasing income inequality trend that has taken place over the past 30 years, our political system continues to favor the top .1% at the expense of the rest of us, not only in terms of our wages, benefits and pensions, but also in terms of the social-ills mentioned above. The only chance we have to reverse this devastating trend is if the Occupy Wall Street movement is successful, and we go back to a time when all segments of the population grow at an equal rate. After all, an equal distribution of income is what enabled the creation of the ‘middle class’, which is now being systematically destroyed. Bottom line: Income inequality is the problem, and income equality is the solution. In my opinion, income equality ought to be the primary focus of the Occupy Wall Street movement. It is all about unionism and demanding good paying jobs! 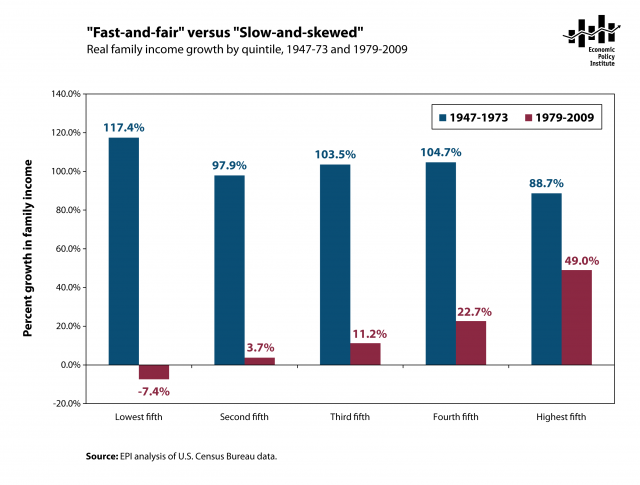 To live within the time frame you are speaking and raise a family you can easily see the decline of America’s economy. Beginning with a household income of less than 30,000 in the mid 80’s, buying a home was achievable along with owning a new car. Today, the same $10.00 an hour starting salary will not buy you much. Jobs have not grown with the economy beacuse the economy is no longer making a product. Nafta, was the destruction of all that was middle-class and Reagan built the foundation of our class demise. We can also thank Clinton, who’s signature sealed the deal.